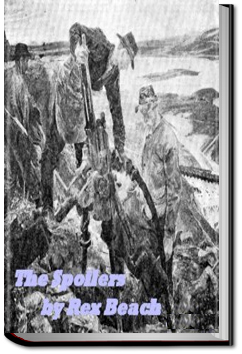 The Spoilers, was based on a true story of corrupt government officials stealing gold mines from prospectors, which Beach witnessed while he was prospecting in Nome, Alaska. The novel begins with the return of Dextry and Roy Glenister to Nome to reclaim their mine, The Midas. On their arrival, they find “The Law” has come to Nome. The problem is “The Law” is crooked, bent on stealing all the best gold mines in Alaska. Alec McNamara is the villain in this novel and rules with a heavy hand through the aging and corrupt Judge Stillman. Helen Chester is the naïve niece of Judge Stillman. She cannot believe her uncle is involved in such treachery. And of course, Roy Glenister is in love with her. After trying to work within the law, the miners eventually form a vigilante group called The Stranglers to right the wrongs while Glenister continues to believe the law can correct the wrongs. This entry was posted in Reading on February 12, 2017 by all-you-can-books.